Saturday October 30th 1926 I went down town by street car. Paid for the paper while away. Had my hair dressed. Was in Otts office and rode home with Rob. Soon after dinner Fannie came and we went to Cedar Rapids with here. She had the baby along and I took care of him while the girls did shopping. It was night when we got home. Wrote cousin Jen. 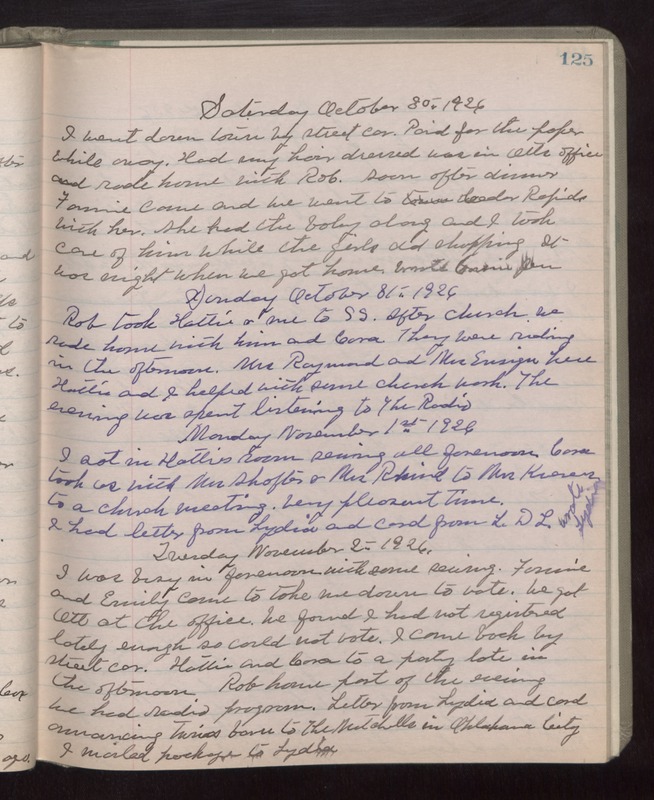 Sunday October 31st 1926 Rob took Hattie & me to S S. After church we rode home with him and Cora. They were riding in the afternoon. Mrs Raymond and Mrs Ensign here. Hattie and I helped with some church work. The evening was spent listening to The Radio. Monday November 1st 1926 I sat in Hatties room sewing all forenoon. Cora took us with Mrs Shafter & Mrs [Rhind?] to Mrs [Kosers?] to a church meeting. Very pleasant time. I had letter from Lydia and card from L D L. wrote Lydia. Tuesday November 2nd 1926 I was busy in forenoon with some sewing. Fannie and Emily came to take me down to vote. We got Ott at the office. We found I had not registered lately enough so could not vote. I came back by street car. Hattie and Cora to a party late in the afternoon. Rob home part of the evening. We had radio program. Letter from Lydia and card announcing twins born at The Mitchells in Oklahoma City. I mailed package to Lydia.